Signs exist to communicate information, but in many communities the sign industry and planning profession currently do not have an effective means of communicating with one another. The core of any relationship between two interests is understanding each other's motivation. From the point of view of local government, the regulation of signs is motivated by the need to ensure public safety and minimize the negative visual impacts of signs in a community. The means by which these goals have traditionally been accomplished have been to limit the size of signs, control their type, placement, and appearance, and, generally, to impose measures to reduce "visual clutter." It is usually not the impact of any one business sign that motivates municipalities to adopt sign regulations, but the long-term, cumulative impact of many private signage decisions. Often the motivating force behind sign regulation is the need to guard against the occasional irresponsible sign application — to create regulations designed for the lowest common denominator or worst-case applicant. The sign industry is motivated by the need to help businesses and organizations inform the public about their location and to take advantage of a relative low cost form of business advertising. And, of course, the need to sell signs is an additional motivating factor for the industry. For planners and building officials, signs are but one component of the complex built environment. And planning for and regulating signs is just one aspect of a city or community design program. 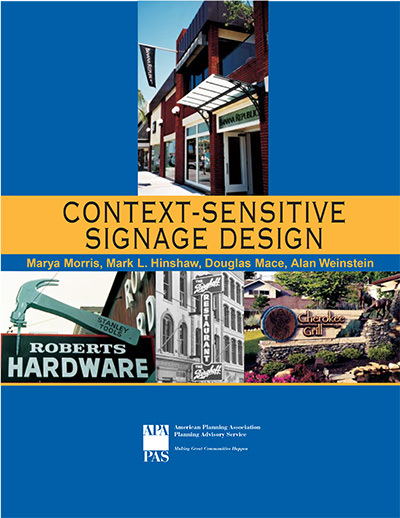 Central to more recent community design programs and aesthetic regulations is the concept of contextualism, which means that new structures and elements of the built landscape (including signs) should complement the existing built and natural environments. This is generally accomplished through guidelines or requirements pertaining to height and bulk, scale, siting, landscaping, architecture, construction materials, texture, and color. One reason that communication has suffered between the sign industry and planners is that, historically, the responsibility for regulating signs has resided with the zoning or code enforcement officer, who may have little connection to the professional planning staff who influence and guide the overall community design program or policies. This arrangement has created few opportunities for planners and the sign industry to engage in any discussion beyond the issue of "does it or does it not conform to the sign code." These circumstances have also created a regulatory environment that sometimes ignores the benefits of signs, including economic development through increased commercial activity and vibrant, colorful streetscapes. Sign law continues to evolve in the courts, and municipalities must be kept up to date on what is and is not permitted by law in the area of regulating signs, which are a form of speech. And many communities have raised the bar in terms of their aesthetic standards and are looking to developers, architects, and sign makers to help improve the visual quality of our communities. Signage policies should represent the broadest possible consensus or prevailing community viewpoint about the physical appearance of the city. And this is exactly the reason that they will inevitably be construed as too restrictive by some and completely reasonable by others.